USA, LIBERTY SEATED SILVER DOLLAR, no motto, 1847. A little polished and cleaned, otherwise extremely fine. 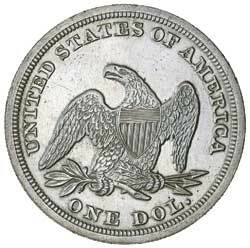 USA, LIBERTY SEATED SILVER DOLLAR, without motto, 1860O. Toned, good very fine. 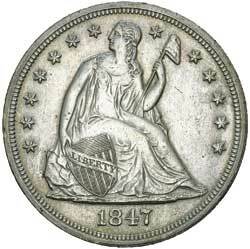 USA, LIBERTY SEATED SILVER DOLLAR, with motto, 1869. Toned, very fine.